"I don't care what I have to do. I just want to lose weight fast..."
First, what is an extreme diet? That's why they're called "starvation diets." And why would you choose such a diet? Because you never discovered the critical factors affecting weight loss and weight gain. When you starve yourself you lose muscle. Now, if you're not a "muscle head" you might not think it matters. But it does matter. We're not talking about he-man muscles. We're talking about your muscles. Muscles need energy. Every time you pick up a pencil or blink your eyelids you burn up energy. Muscles are the way you burn up calories. Your muscles burn up the fat. Fine. So why not the extreme diet? You need a real solution to lose weight. 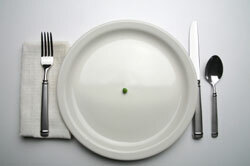 Starvation diets are a false solution. Look at it this way. When you starve yourself (or go on a very low calorie weight loss diet, which is the same thing) your body tries to cut down on the calories it uses. One of the ways it does this is by burning up muscle. Why? Because it is trying to save energy. When you are trying to save energy you get rid of whatever uses energy, right? So you burn up muscle. It sounds awful, but your body is actually eating itself. Second reason -- when you are starving yourself you need energy. You know the feeling. You don't eat for a while and you feel weak and sick and lightheaded. You get "hypoglycemic" -- meaning your blood sugar drops too low. How much sugar can you store? Your blood sugar -- all the sugar in the blood in your entire body -- is only about 120 calories. That's it. You can store another few hundred calories of sugar as glycogen in the liver. And that's it. That's why if you don't eat for a few hours you can have low blood sugar, feel dizzy, feel like you are going to pass out. And so you get cravings. For whatever you can find to eat. Chocolate. Cookies. Doughnuts. That's why leaving home without food will ruin your diet. So what happens when your blood sugar is too low? Your body does whatever it can to make some sugar. What does it make the sugar out of? Not fat. Your body can't make sugar out of fat. But it can make sugar from the amino acids that make up your body's protein fibers. So that's what it does. Muscle is made of small building blocks called amino acids. And these amino acids are perfect for making sugar. So if you go on a low calorie diet -- especially if it is also an ultra-low-carb diet -- you have to get sugar somewhere. Your body takes the amino acids in your muscle tissue and turns them into sugar. You can't turn fat into sugar in your body. There's no way to do it. You don't have the right enzymes. But you can turn muscle into sugar. So to keep your blood sugar up -- your muscles break down. So you end up weak. Tired. Hungry. Slow metabolism. And when your metabolism is slow you gain weight easily. And what's worse? The weight you gain is all fat. Why is it all fat? Because your body has been trained to break down muscle. Not to build muscle. So it has a hard time making muscle. After you diet your body has an easy time making fat. And so it stores the extra weight as fat. So your body makes the sugar it needs from the muscle, and you get weaker, and your metabolism is slower. You get frustrated because you are not seeing results. And you go off your diet. This can lead to very serious trouble with your weight and binge eating. Then you feel like you are starving. You don't know how to stop overeating. Soon you have gained back the weight you lost. But the weight you gained back is mostly fat, not muscle. So you are fatter than you were before. And that is why you shouldn't go on an extreme diet.